The biggest event of the year is back! The YUSU Summer Ball is the perfect end of year celebration, and for many of you, it is also the perfect chance to round off your time at university in style. The date is Tuesday 11th June, and the venue is the glamorous York Racecourse. For a limited time only, you can buy an Early Bird Summer Ball ticket for a special discounted price. A Graduation Dinner ticket means the celebrations start early, splashing off with a glamorous drinks reception on the lawns of Heslington Hall. A free bus service then whisks you away to the York Racecourse where a delicious three course meal awaits. You will be able to make sure you are sat with your friends by completing a seating form which will be sent to you a few weeks before the event. Make sure you complete this as soon as you get it to avoid any disappointment! At this point you will also be able to tell us any dietary requirements. Special acts and entertainment are reserved exclusively for dinner guests. You then have priority access to all the fairground rides before the other guests arrive from 8.30pm for the main event. But that's not all. What really makes the Summer Ball special is you lovely lot, all together for one massive celebration before the end of the year. ...Will you make it to the Survivors Photo at 4am? Students who do not attend the University of York are welcome to attend as the guest of a UoY student, but valid ID must be presented on entry as proof of age. 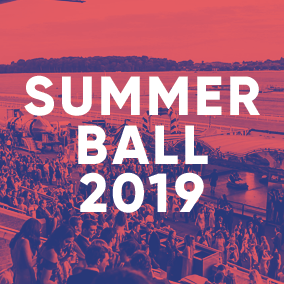 Early Bird Ticket to the YUSU Summer Ball at the York Racecourse. Early Bird Ticket to Graduation Dinner & YUSU Summer Ball at the York Racecourse.